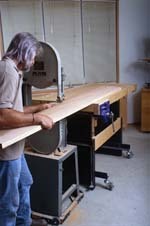 Lower the bench to involve more of your body's weight when performing heavy duty tasks such as hand planing. When rounting, there's no need to bend over to gain access to your work. Bring the work up closer to eye level and save your back! 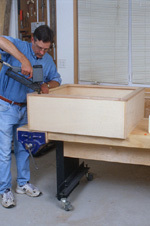 When assembling projects, lower the Adjust-A-Bench to keep the work at a comfortable level. When cutting joints by hand, it's good to have the work close to your eye without bending over into an uncomfortable position. Subtle hand motions can be more effectively guided. 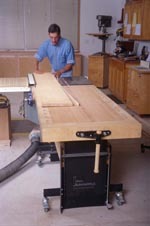 Don't have room for an outfeed table for your tablesaw? The Adjust-A-Bench can help. 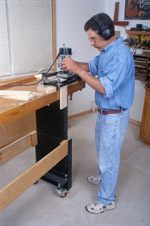 Engage your casters, roll your bench to an outfeed position, adjust the height using the Adjust-A-Bench leg set, and then fine tune that height using the 4" caster mounting bolts. Using the optional caster package, you can fine tune the height of your Adjust-A-Bench to accomodate any outfeed application, even those as high as the band saw or drill press. 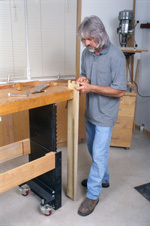 The Adjust-A-Bench can be shared by other people and used in applications other than woodworking. 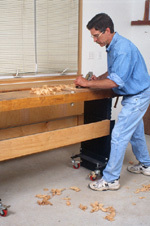 Here, the one rail bracket system has created a bench suited for seated work. Additionally, wooden feet have been added to broaded the bench footprint.